Financial expert Ernst Wolff gives Sputnik a taster of his new book, which warns that dependence on the financial industry and the US dollar has created a "financial tsunami," the consequences of which the world is wholly unprepared for. Financial expert Ernst Wolff, author of a bestselling analysis of the International Monetary Fund's "modern day crusade against the working people on five continents," has turned his attention to the global financial system in his latest book. Wolff sees the financial system at risk of imminent collapse and likens it to a "Financial Tsunami" which threatens to take us all by surprise, leaving devastation in its wake. 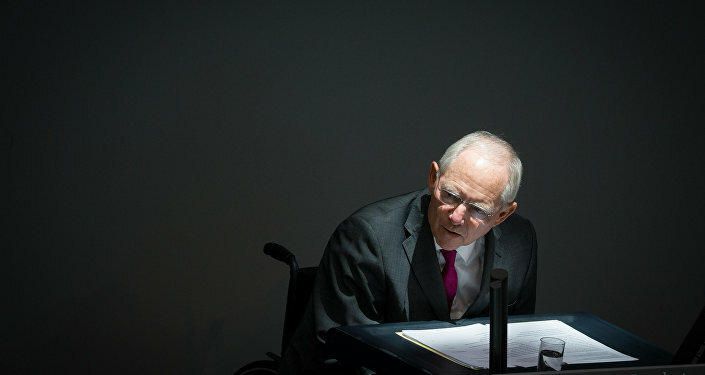 In a taster of the book's contents, he told Sputnik Deutschland that the US-based financial industry has been on "life support" since the 2008 crisis and its prognosis "doesn't look good." "The patient is about 75 years old. Our financial system was founded in in Bretton Woods, USA in 1944. The patient is in great difficulty because in 1998 and a second time in 2007/2008, he almost died. Since this second crisis, he has only been kept alive artificially. The financial system is lying in the intensive care unit." While most countries have a state central bank, US monetary policy is conducted by the Federal Reserve, a consortium of 12 regional banks in which commercial banks own shares. Wolff describes the system as a "cartel." "One not only gives a patient a diagnosis, but also a case history. First, we need to understand the power of the Federal Reserve, the American central bank which was established a hundred years ago. Many people still don't know that the Federal Reserve is not a state institution, but is in private hands. This is a bank cartel which lies in the hands of several large, very rich families. This fact has been covered up in the course of history." "Since 1944, the dollar has been the most important currency in the world, and since the mid-seventies it has been the most important reserve currency because oil, the most important and most traded commodity in the world, can only be traded in dollars." "But the dollar has been hit because the US has been hit. There is great competition on the world market, especially from China. However, it takes time to replace the world's main currency. Those who have opposed the dollar until now have suffered a terrible fate. Saddam Hussein was the first to try to sell his oil in euros, and he was executed. Then Gaddafi tried the same in Libya, and we know how that ended. The conflict with Iran is also related to the fact that Iran has announced its intention to sell its oil in euros, and now we have the next flashpoint of this kind with Venezuela." Wolff says that the financial industry has grown in power along with the US dollar. The proportion of the world economy stemming from the financial industry has increased significantly in recent decades, although the exact figure depends on pinning down a definition of financial services. The IMF estimates the total service economy to make up 60-65% of total global revenue, while the OECD has suggested that financial services comprise 20-30% of the total service market. Wolff declared that "the financial economy is infinitely larger than the real economy and has been completely detached from the real economy by not producing anything of value." "In the last 30 years it has become a huge casino in which money is simply pushed back and forth. Since the system is built on loans that need to be serviced, more and more money must be pumped into the system. The central banks, such as the IMF or the ECB, are the largest manipulators of the financial system. They are printing more and more money, which they now offer for zero or negative interest rates." The financial system rules the world yet it seems impenetrable to most ordinary people, Wolff said. "That's the way it's meant to be. Today, people in finance speak a language that a normal person can no longer understand. They hide behind it," Wolff said, likening the discourse to the "Doublespeak" in George Orwell's book 1984. "You mustn't lose yourself in the details, you have to see the big picture. With derivatives, for example, there are all sorts of options — puts, options, calls, swaps. You don't have to know all the differences. You just have to know that derivatives are financial betting. And this huge bookmaker threatens us all." Wolff said that the finance industry is to blame for many of the problems currently facing Europe, which at first glance seem unconnected. "The two prime causes of the refugee crisis are social inequality and wars. The financial industry is at fault for both. In the background, big investors are making money from wars and also treat the third world like a Christmas tree."